Frances Shani Parker is author of Becoming Dead Right: A Hospice Volunteer in Urban Nursing Homes. This groundbreaking book is the captivating account of her hospice volunteer insights and experiences in Detroit, Michigan nursing homes. Stories, general information, and poems explore hospice care, urban nursing homes, caregiving, dementia, death, and bereavement. Pain management, death preparations, disparities in healthcare﻿, and strategies for improving healthcare and nursing homes are also examined. Becoming Dead Right presents universal perspectives, particularly the often-missing voices of urban dwellers and people of color. "The writing is eloquent and powerful, and the stories are instructive and lasting. After finishing this book, I wanted to do more for other individuals who are dying, for as Ms. Parker so clearly imparts, the dying teach us so much about living well." "A school principal and hospice volunteer, Frances Shani Parker relates her experiences with dying people in nursing homes. The second part of her book is about what we as individuals and as a society must do to improve things for those who are dying. I particularly enjoyed the guided tour, conducted from a wheelchair, of Baby Boomer Haven." "This book is filled with poetry, stories, wisdom and common sense that can help boomers, students, caregivers and policy makers understand their own aging and realize that our society can and should make important changes that can ensure safe, dignified, individualized care at the end of our lives." "I have been working in the hospice industry full-time for years, and I have not seen a better depiction of this topic. Ms. Parker's book gives the most descriptive and genuine look into the true nature of hospice. I think her book should be used for training in hospice courses and within hospice organizations across the country." "Ms. Parker brings to light the urgent need for quality care in communities with people of color. Regrettably, even in dying, there are disparities and injustice. Frances Shani Parker has written a remarkable book with a unique perspective.﻿"
"Reading this book was extremely enlightening. Not like any other book I have ever read, it is so interesting and well written that I could hardly put it down. 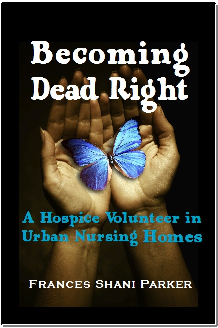 I highly recommend this book for everyone.﻿"
Copyright 2013 Becoming Dead Right: A Hospice Volunteer in Urban Nursing Homes. All rights reserved.